Make sure if your Rottweiler has good angulation in the rear. 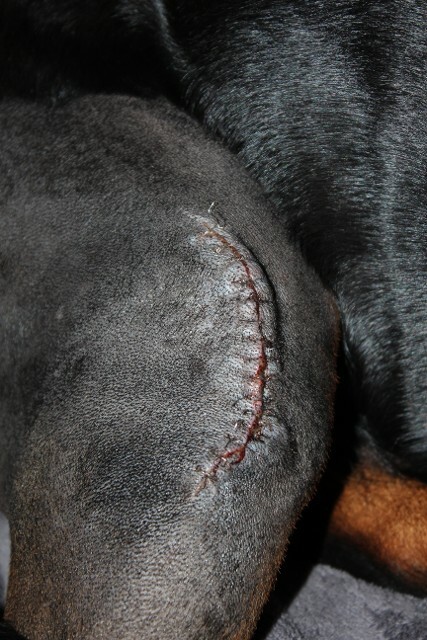 The Rottweiler is one of the most common dogs that get a cranial cruciate ligament rupture (CCL). The cruciate ligament tends to undergo degenerative changes before it ruptures. It does not mean it is a heriditary disease. Very active dogs need angulation in the rear legs. If there is no angulation, the ACL can streatch and even tear in half. This is accadent is associated with people playing football or basketball. 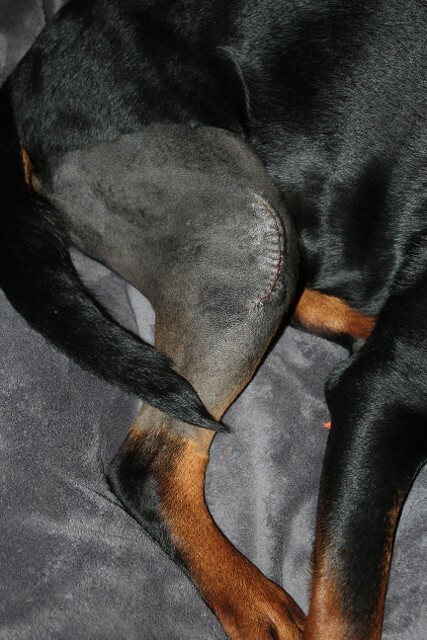 The video to the left is not a surgury on a Rottweiler but the ACL and Tear is the same in all breeds. This is in contrast to people, where rupture is often associated with an injury such as skiing or playing football. This important difference explains why treatment options in dogs are quite different to those in people. The reason the cruciate ligament degenerates prior to rupturing is not clearly understood. Certain breeds, such as Labradors and Rottweilers, are much more commonly affected than others. This suggests there is an inherited component to the condition, possibly related to conformation or gait. The signs of CCL rupture can be quite variable as rupture may be sudden and complete or gradual and partial. The key signs are hind limb lameness and stiffness. The latter is generally most evident after rest following exercise. Difficulty rising and jumping are common features in dogs with both knees affected. Occasionally 'clicking' noises may be heard. TPLO stands for Tibial Plateau Leveling Osteotomy, which in simple english means that they are changing the bones of the knee joint to make them work in a different, more “level” manner. The veterinary surgeon will start by making an incision in your dog’s injured leg, and the cut will be made down the length of the leg. Through this incision the veterinarian will then access the injured acl (or ccl as it is more properly called in dogs) and begin by removing the severed, torn and/or ruptured ends of the ligament. Once the cranial cruciate ligament damage has been removed, a cut is made in the top of the tibia. Measurements are then taken and compared to those from the pre-op x-ray, and the tibial plateau is positioned to make the slope of the knee level. A plate is then screwed into the top of the bone to allow the bone to heal in its new angular position; the metal plates can be removed later, although this involves another procedure. Specialists believe stifle angulation is a contributing factor in the amount of CCL tears in dogs. When the CCL is torn, their methods are to change the angulation with the procedure TPLO (tibial plateau leveling osteotomy) from 115 degrees to 95 to render the CCL.